Attorney Emily S Abel - Biography | National Legal Research Group, Inc. B.S., Tulane University, 2012. J.D., Marshall Wythe School of Law, College of William & Mary, 2015. Member, Virginia Bar. Emily is a graduate of the Marshall Wythe School of Law at the College of William & Mary and a member of the Virginia Bar. While in law school, Emily served as an Articles Editor of the William & Mary Law Review. Her student note, “Don’t Text a Driver: Civil Liability of Remote Third-Party Texters After Kubert v. Best” was published in Volume 56 of the William & Mary Law Review. 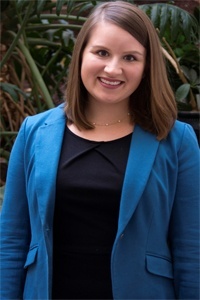 After law school, Emily served as a judicial law clerk to the Honorable H. Thomas Padrick, Jr. and the Honorable Leslie L. Lilley of the Virginia Beach Circuit Court. Since joining NLRG, Emily has worked on projects in a variety of areas. Outside of the office, Emily enjoys exploring Charlottesville, reading, and spending time with her family.